Update: The Steelers Won! Gang Green Was Stopped by the Steel Curtain. In a mere few minutes my brother-in-law Michael and I go head to head: His NY Jets versus my Pittsburgh Steelers. 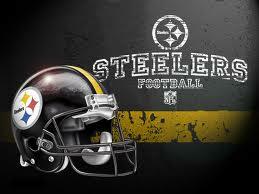 I’ve admired the Steelers team for years, decades even, but I never actually called them my team. When asked, I’ve said the New York Giants are my team since I watch those games with my rabid-fan-husband Mike. Recently, though, I declared myself a Terrible Towel Trainee. I’m from western PA and those fans, those crazed towel twirling fans, are my cousins, aunts, and uncles; they are my people, for better or for worse. We're gonna be swinging the towel, just swinging the towel! I love the rag tag-edness of the Steelers of old, the current dudes with long hair and fast legs, the wacky quarterback, the cerebral, let-nothing-show head coach. 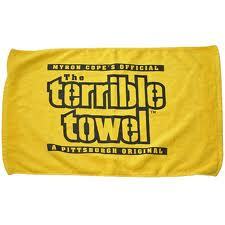 Tonight, I want my Steelers to roll over Gang Green. I want them them to be Super Bowl bound. I want to be able to rub it in to my brother-in-law that black and gold trumped green! 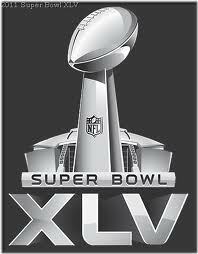 Pittsburgh Steeler + Super Bowl = Awesome! That’s it!!!! Unfortunately I am the only one in the house here in PA that’s a Steelers fan. Your cousin, Len, has turned to the dark side of the Jets! It’s an utter shame, I know. Let’s go Black and Gold!!!!! You should play this song loud in you home…http://www.youtube.com/watch?v=UePtoxDhJSw&ob=av2el…it is the black and yellow song! Haha! Enjoy the game!!! Steelers score less than 10 minutes in. Take that Gang Green!! Ah yes but now your Steelers play our Packers. It will be most excellent game between two historical franchises!!! Game on, my love! Game on!